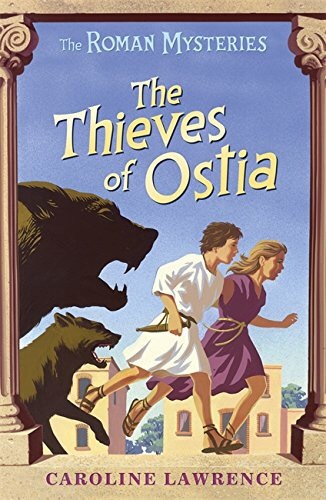 The Thieves of Ostia is the first in Caroline Lawrence’s Roman Mysteries series. The greatest mystery of this book is: how on Earth did it take me so long to read it? Child detectives? Right up my street. Set in Ancient Rome? I studied Classics at university, for goodness’ sake! It would be difficult to find a book that pushed my buttons quite so much. So the mystery of how I only read this book now, in 2015, nearly fifteen years after it was published, is probably one that will never be solved. But if anyone could solve it, it would be Flavia Gemina and her band of friends. In this, her first case, someone is killing dogs in Ostia, and it’s up to Flavia, her neighbour Jonathan the Jewish boy, her slave Nubia, and the mute beggar boy Lupus to track down the culprit. There’s more to the case than a simple matter of animal cruelty, though, and it takes all of their pluck and ingenuity to get to the bottom of the mystery. Flavia is a great character – clever and determined, like all the best child detectives. Her friends are a great complementary bunch with their own strengths and talents. The story cracks along at a great pace, with plenty of thrills and peril to keep you entertained. There’s a lot of historical detail, too, which makes the setting really come alive. None of it is dry or lecturing, though – it’s not a history book, it’s a thrilling story that happens to be set in ancient times. But I’d be willing to bet that a lot of the children who read this book will be intrigued by the historical aspects of the book and, with a little bit of luck, might be inspired to investigate further into this fascinating period of our history. As someone who’s watched the teaching of Classics in schools diminish enormously since I was a lad, this can only be a good thing. There’s one positive aspect of me coming to this series so late – there are sixteen more mysteries listed in the front of the book, so there’s plenty more about Flavia et al to catch up on.